Except for a few days last week, it has been a fairly grey January and February. Downright depressing, actually. So, to stave off the blues, I went stash diving to find something cheerful and bright. The idea was to bring a little sunshine into my corner of the world. And did I ever find it! 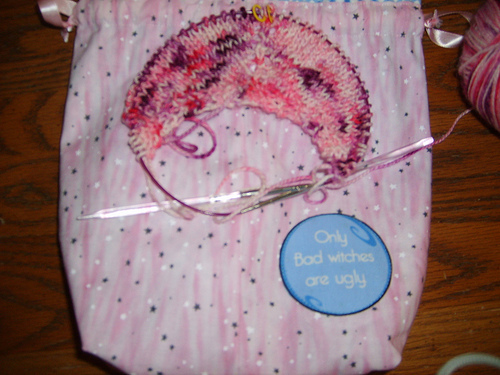 A skein purchased as part of a “Return to Glinda the Good Witch” kit from http://www.woolgirl.net. The yarn itself is a 4-ply merino-blend washable sock yarn. The kit came with a sock and a scarf pattern, along with a slew of other goodies. Yarn in hand, I trolled through Ravelry’s patterns and found the ideal project for my Glinda yarn — “In The Land Of Oz” Shawl by Adrienne Fong. I cast on at our weekly knit night and it seems to be a quick knit so far. Knit from the center top down, most of the first part is stockingnette. The peacock lace pattern looks to be fairly easy. I am hoping so, because I would like to complete this shawl before summer. I’ll let you know how it goes. How about you? Are you trying to bring some “sunshine” to your world? Let’s share and maybe spread that sunshine around!